Junior Matt Nieto scored with 3.8 seconds left in overtime to lift the Terriers past Maine, 5-4 and to a three-point weekend at Alfond Arena in Orono. 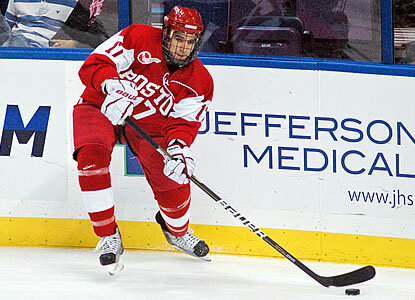 Nieto (photo) finished off a two-on-none rush with sophomore Evan Rodrigues for his ninth of the season. Freshman goalie Sean Maguire backstopped the victory with 40 saves--17 in the first period--to gain his 7th win, which moved BU into a third-place tie with New Hampshire, just two points behind new leader Merrimack. Freshman Danny O’Regan paced the offense with two goals and an assist while sophomore Cason Hohmann had a goal and an assist and both senior Ryan Santana and freshman Ahti Okasanen each had a pair of power play assists. Maine scored the only first-period goal, but the middle stanza belonged to BU as O’Regan, Hohmann and Matt Grzelcyk gave the Terriers a 3-1 lead. O’Regan’s second power play goal extended the lead a minute into the third period, but the Black Bears roared back to narrow the lead to one. With less than a minute remaining regulation, they scored an extra-attacker goal, but Nieto doused the home crowd’s excitement with his last-second heroics in overtime. In EJHL action, 2013 recruit Kevin Duane scored both Junior Bruins’ goals—his 10th and 11th in 23 games—in a 2-1 win against Jersey, while 2013 recruit Brendan Collier scored his 12th goal for Valley Junior Warriors in a 5-2 win against Portland. Junior co-captain Marie-Philip Poulin scored her second goal of the game with 90 seconds left in regulation to push #3 BU past Vermont at Walter Brown Arena. The victory gave Terrier Head Coach Brian Durocher his 150th career win. The former BU goalie and assistant coach to Jack Parker is the only coach the women’s program has had in eight seasons. The visiting Catamounts got on the board just two minutes in the game. Poulin tied the score midway through the second period, with assists from Jenelle Kohanchuk and Jill Cardella. Passes from Kaleigh Fratkin and Kathryn Miller set up the game-winner, which was Poulin’s 14th goal of the season. Senior Alissa Fromkin stopped 25 shots for her fourth win of the season. The win kept BU tied with BC for first place in Hockey East.